While most organisations were against the Bill, health and education showed a higher level of support than other areas. 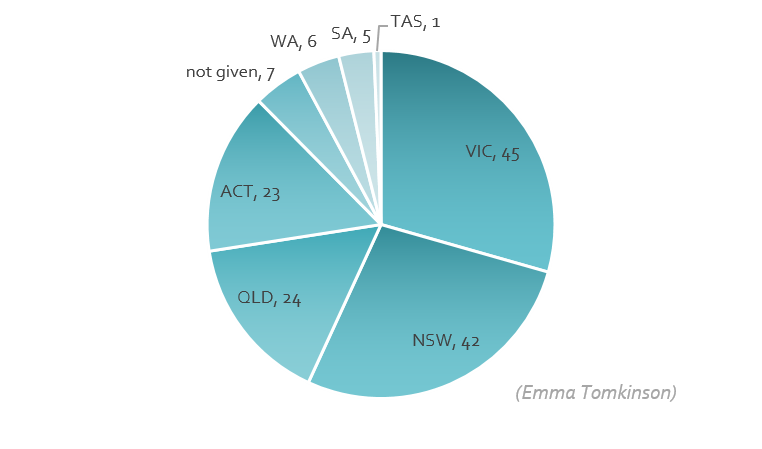 Organisations and individuals providing services to the sector were very strongly against repealing the ACNC. The following sections give quotes that are representative of the arguments made. There is no intention behind the choice of whom to quote, apart from that an attempt was made to include a range of organisation. South Australian Council of Social Services: “The repeal of the ACNC will stop an immediate red tape reduction measure in South Australia.” They described the state-specific situation where legislation to remove state reporting requirements and abolish the burden of fundraising licences is ready to be introduced to parliament, but is on hold as it is predicated on the existence of the ACNC. ACT Government: “uncertainty over the future of the ACNC has made it impossible for the ACT to withdraw from the regulation of the sector in the ACT, or to continue with the development of an MOU with the ACNC. The inability of the ACT to pursue its intentions in this area will result in a significant lost opportunity to reduce unnecessary administrative impact on the sector.” It estimates the cost of this opportunity at around $2m per annum. Speed up the organisation of charity tax concessions (by acting as a liaison between us and the ATO). Reduce the time and cost of auditing. Consumers Health Forum of Australia: “Consumers, who, in the health sector are contributing an increasing proportion of their own funds towards the purchase of health services, now at over 17%, deserve the best information on health services. It is essential that they have access to independent, transparent and accessible information on community and charitable health services, so that they are able to make informed health service purchasing choices. Without this level of transparency in the system, they are significantly disadvantaged in the use of the purchasing power in the health market to support well governed and robustly managed services. that regulatory oversight of the sector be undertaken under the principles of necessity, risk and proportionality. Our Community has a history of consultations and the number of submissions made to each at the end of its submission. A. Establishing a public register of Australian charities. B. Producing a raft of valuable resources, including fact sheets, interpretation statements, guides and reports to equip charities. C. Providing a framework to hold our nation’s charities accountable and ensure appropriate compliance. D. Increasing efficiency by enabling charities to deal with a one stop shop rather than a number of government departments. ACNC: Research commissioned by the ACNC found that trust and confidence in Australian charities increased significantly, when they understood the role of the ACNC. The research also found 77% of participants believed a public register of charities to be ‘very important’. These findings are consistent with similar surveys conducted over many years by the Charity Commission of England and Wales. Breast Cancer Network Australia: “Australians wishing to donate should have the ability to access and research information about any charity, so they can be confident the funds they are donating are being used for the stated purpose. There have been numerous reports and instances where the public have been donating to so-called charities which are not using the funds for the purpose which was claimed. “As an example, BCNA has over the years received a number of complaint phone calls from distressed members of the public regarding a similarly named charity which was aggressively fundraising, thinking the approach was from our organisation. On further investigation, it was discovered that the charity was not registered with the ACNC and more alarmingly had been deregistered in South Australia. However this organisation was able to continue to operate their fundraising activity in other states. Average visit is 6 minutes, people visit approximately 5 pages per visit. The central register for NFPs and charities, which should be maintained as a free and searchable public register so that anyone can look up information about registered charities. The provision of advice to charities and NFPs so that information, guidance and other support regarding regulatory obligations and compliance is easily accessible and available. ACNC: From June 2013, the ACNC took carriage of the ongoing maintenance and updating of the National Standard Chart of Accounts (NSCOA), an initiative of the Queensland University of Technology. NSCOA provides a common approach to capturing accounting information for use by not-for-profits and government. The Commonwealth, state, territory and local governments agreed through Council of Australian Governments to accept NSCOA for all reporting purposes. NSCOA, and the ACNC’s stewardship of it, has made a significant contribution to red tape reduction. One state alone has estimated savings of $3.1 million a year over ten years. In the event of the abolition of ACNC, a home needs to be found for the NSCOA initiative so its potential is not lost. Community Council for Australia: “In its first 16 months of operation, the ACNC received 686 complaints which resulted in over 250 investigations. Most of these investigations have been resolved through various forms of mediation and working with the charities themselves. ‘Previously if anyone complained to the Australian Taxation Office (ATO) about the operations of a charity, no-one knew what happened. The ACNC regime imposes reporting obligations on the trustees of charitable will trusts that did not exist formerly. The ACNC administers the ACNC Act, Australian Charities and Not-for-profits Commission (Consequential and Transitional) Act 2012 (Cth), and the Australian Charities and Not-for-profits Commission Regulation 2013 (No. 3) (Cth). There are 39 other pieces of legislation relevant to the ACNC’s operations which would need to be reviewed if the ACNC is abolished. providing advice and guidance to the sector and the public, to enhance the transparency and good governance of the sector. *Declaration of interest: Emma Tomkinson is a sector researcher and analyst. She is the author of one submission opposing the ACNC Repeal Bill and has very much enjoyed engaging with the ACNC over the last six months as an external stakeholder. She is not, nor has ever been, employed by the ACNC. Interesting. Some of the early coverage of support to ditch ACNC stressed that it was mostly Catholic groups who wanted it gone. Not sure this supports that assertion (but still can’t believe anyone wants it gone). This was mentioned in a few submissions – it may be that the powerful Catholic education and health peak bodies have pushed hard for this, but they’re not the only organisations for the Bill. Organisations against the Bill (that want to keep the ACNC) also include Catholics and those that run schools and hospitals, so the group supporting the Bill isn’t clearly defined by a set of similarities. Well done on this analysis, it largely reflects my own analysis, after reading all the submissions. I also agree with your commentary in the comments above. Part of the opposition to the abolition of the ACNC comes from the Universities and the enormous medical research centres, which points to one of the problems that we have and which neither retention not abolition is going to fix, which is that in Australia very different kinds of not-for-profit organisations tend to end up in the same legal form (universities and soup kitchens are both charities) and the same kind of organisations can end up in very different legal forms (it’s basically a lottery whether most NFPs become incorporated associations or companies limited by guarantee). Ideally, we’d go back to first principles (and wipe out trusts altogether).